The photographer and author in front of one of his subjects. 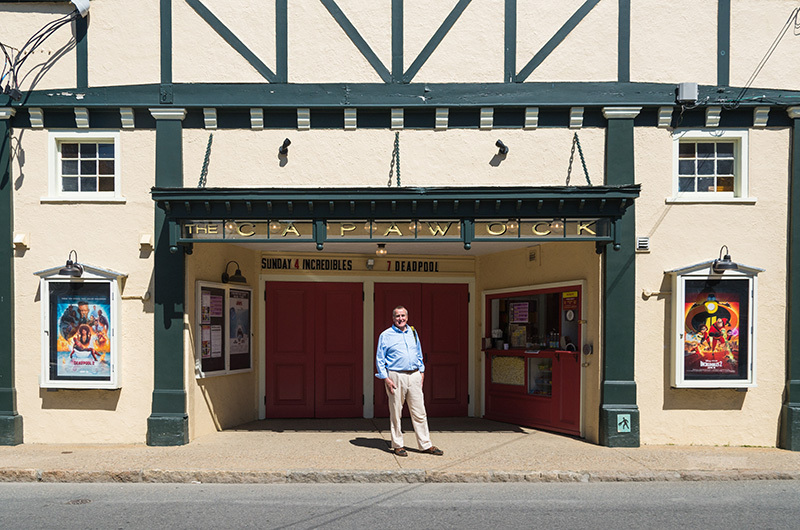 The opening photograph in West Tisbury resident Max Skjöldebrand’s book of photography A Tale of Two Theaters, shows the Strand Theatre in drabby disrepair. In the center of the picture is an orange plastic work bucket, with the words “Let’s do this,” on the side. As much as any picture in the book documenting the rebirth of the Capawock Theatre in Vineyard Haven and the Strand Theatre in Oak Bluffs, the photograph tells the story of a remarkable project completed in astonishing time. 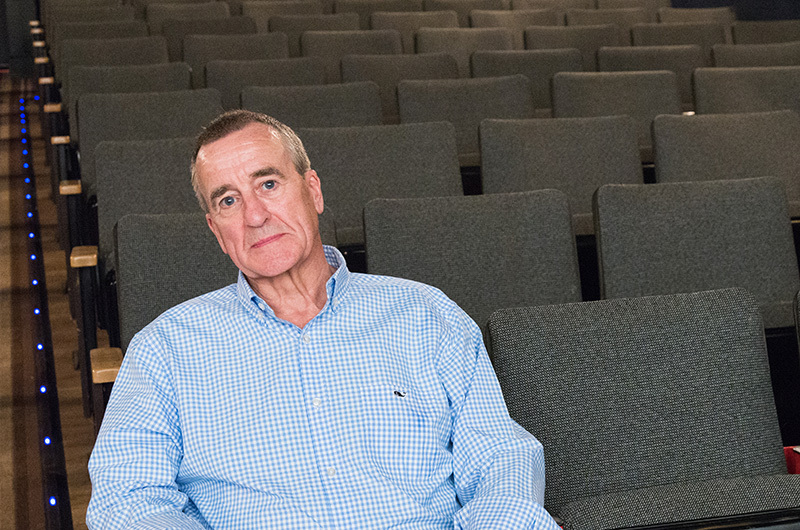 In 2015, Island hoteliers Mark and Gwenn Snider formed the Martha’s Vineyard Theater Foundation, raised funds, and began restoration of the two historic theaters. From the beginning, Mr. Skjöldebrand was there to record the process with his camera, on the work site almost every day to capture the sometimes mundane, sometimes majestic job of restoring grandeur. When he heard about Mr. Snider’s project, the idea struck for a book. Mr. Skjöldebrand had a distinguished career as an architect, mostly in London and Dubai, before retiring to Martha’s Vineyard in 2010. A number of his interests converged on the book project. Making pictures inside a theatre would seem a daunting task for a photographer. It is dark, and there is a lot of big empty space. But Mr. Skjöldebrand employed a few tricks of the trade to create photographs that tell the story of the renovations in both documentary and artistic fashion. In his preface to the A Tale of Two Theaters, Mr. Skjöldebrand wrote that it was important to him to capture the projects with his camera.